The Chief, powered by a trio of Alco PA units, passes near Littleton, Colorado on July 15, 1951. "Drumhead" logos such as these often adorned the ends of observation cars on the Chief. 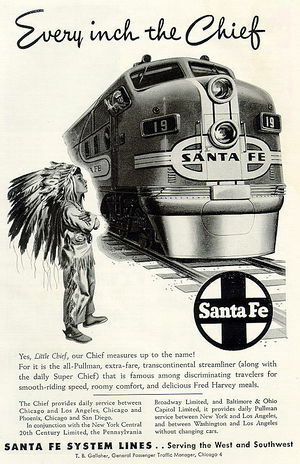 The Chief was one of the named passenger trains of the Atchison, Topeka and Santa Fe Railway (AT&SF). The train was inaugurated as an all-Pullman limited train to supplement the road's California Limited, operating between the cities of Chicago, Illinois and Los Angeles, California, with an extra surcharge of $10.00 for an end-to-end fare. The heavyweight consist began its inaugural run from both ends of the line, simultaneously, on November 14, 1926, making the cross-country trip in the advertised 63 hours, a speed that brought the East and West one business day closer. The Chief became an instant success, gaining the slogan "Extra Fast-Extra Fine-Extra Fare" though it failed to relieve traffic on the Limited. The Chief quickly became famous as a "rolling boudoir" for film stars and Hollywood executives alike. In time, the Chief would reduce its schedule to equal that of its cousins, the Super Chief and El Capitan, and would ultimately drop the extra fare requirement as well. 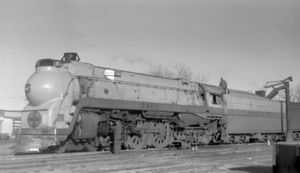 The Chief would have been the "crown jewel" of most railroads' passenger fleets. However, it did not survive the national decline in passenger demand and ended operations on May 15, 1968. 1926: In order to supplement the California Limited, Santa Fe inaugurates the all-Pullman, extra-fare limited heavyweight Chief, running between Chicago and Los Angeles. November 14, 1926: The Chief makes its initial run from both ends of the line, simultaneously. 1937: The Santa Fe announces that the Chief will receive all streamlined (lightweight) cars to replace the original heavyweights, and will run on a 50¾-hour schedule. February 22, 1938: 10 new streamlined cars are placed into service. 1942: Consist size expands to 13 cars, and each logs 743 daily miles. 1945: The train receives a complete replacement of rolling stock, and the schedule is reduced to 45 hours. 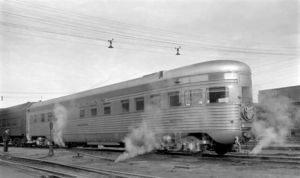 March 27, 1947: New sleeping car service is inaugurated to go directly to San Diego. December 14, 1953: The 45-hour schedule is reduced to 39 hours, 45 minutes eastbound and 39 hours, 30 minutes westbound. January 10 1954: The fare surcharge is dropped after the Union Pacific Railroad reintroduces its all-coach Challenger train. 1954: Coaches are added to the Chief and dining service is limited to a lunch-counter coffee shop car. Round-end observation cars are removed, leaving the train without such equipment since its inauguration. The cars are blunt-ended at Pullman's Richmond, California facility and returned to service in the new San Francisco Chief's consists as Pullman lounges. 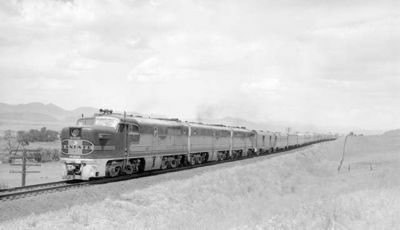 1956: Santa Fe transfers transcontinental sleeping car service from the Super Chief. September 5, 1956: A Santa Fe fireman from the stationary eastbound Fast Mail Express throws a switch right front of the speeding Chief near Springer, New Mexico, causing it to enter the siding occupied by the Fast Mail Express and collide head-on with the idling train. Both engine crews (save for the hapless Fast Mail fireman) are killed instantly; a total of twenty train crew and Chief dining car employees are killed in the collision. Thirty-five additional passengers and crew members are injured. May 15, 1968: The Chief ceases operations as a passenger train; Santa Fe will resurrect the name for its new fast "piggyback" freight train later that year. Summer 1972: Amtrak revives the Chief for a three month period, utilizing the original passenger service schedule and train Nos. 19 & 20. Santa Fe #3718, a type 4-8-2, pulls train No. 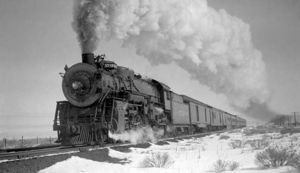 19, the Chief, with an 8-car heavyweight consist west of La Junta, Colorado on March 18, 1934. Santa Fe #3460, nicknamed the "Blue Goose," pauses to take on water at Syracuse, Kansas in February of 1941. The streamlined Pullman observation-lounge car Coconino, coupled to a heavyweight sleeper painted in two-tone Pullman grey, brings up the rear of the Chief at La Junta, Colorado on February 27, 1938. One of Santa Fe's "Big Dome"-Lounge cars originally built by the Budd Company for El Capitan; eventually, these cars would find their way into consists on nearly every main line (including that of the Chief. A 1948 print advertisement promotes service on the Chief. 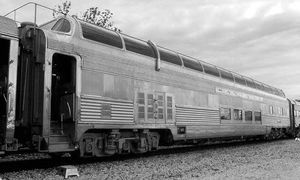 "Transcontinental Sleeping Car Service" was inaugurated in Spring 1946, and the Chief began regularly carrying three such cars in its consist: two originating in New York City, and the other in Washington, D.C. (most often these were smooth-sided cars painted two-tone Pullman grey). By the following summer, the Chief had retired all of its steam-driven motive power and was usually pulled behind A-B-B-A sets of EMD FT locomotives or A-B-A sets of the new ALCO PAs. Sleeper Citrus Valley (6 sections, 6 roomettes, 4 double bedrooms) (ran from Chicago, Illinois — Denver, Colorado; switched out at La Junta, Colorado). Sleeper Estancia Valley (6 sections, 6 roomettes, 4 double bedrooms) (ran from Denver, Colorado — Los Angeles, California; switched in at La Junta). *NOTE: The nineteen "10-2-3" sleepers in the Blue series had a floor plan configuration unique to the Santa Fe. This page was last modified 03:40, 1 October 2014.